Early Wednesday morning, the sun released two powerful solar flares -- the second was the most powerful in more than a decade. 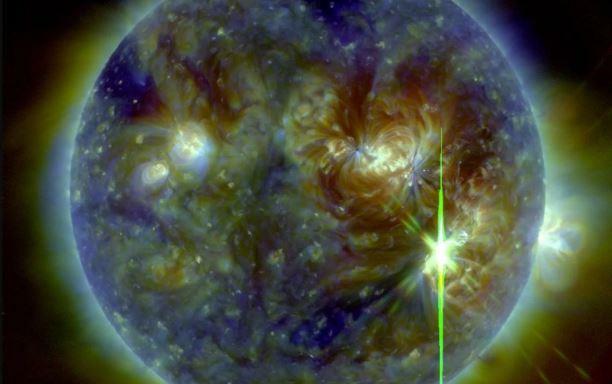 At 5:10 a.m. EDT (Sept. 6), an X-class solar flare -- the most powerful sun-storm category -- blasted from a large sunspot on the sun's surface. That flare was the strongest since 2015, at X2.2, but it was dwarfed just 3 hours later, at 8:02 a.m. EDT, by an X9.3 flare, according to the National Oceanic and Atmospheric Administration's Space Weather Prediction Center (SWPC). The last X9 flare occurred in 2006 (coming in at X9.0). According to SWPC, the flares resulted in radio blackouts: high-frequency radio experienced a "wide area of blackouts, loss of contact for up to an hour over [the] sunlit side of Earth," and low frequency communication, used in navigation, was degraded for an hour. Solar flares occur when the sun's magnetic field -- which creates the dark sunspots on the star's surface -- twists up and reconnects, blasting energy outward and superheating the solar surface. X-class solar flares can cause radiation storms in Earth's upper atmosphere and trigger radio blackouts, as happened earlier this morning. During large solar flares, the sun can also sling a cloud of energetic plasma from its body, an event called a coronal mass ejection (CME). The orbiting Solar and Heliospheric Observatory, a joint project between NASA and the European Space Agency, later provided that answer when it picked up the coronal mass ejection from the event, although according to SpaceWeather.com NOAA analysts are still modeling its trajectory to see whether it is directed toward Earth. The sunspot responsible for this morning's flares, active region 2673, is the smaller of two massive spots on the sun's surface, at only seven Earths wide by nine Earths tall, according to astrophysicist Karl Battams. On Tuesday, that same sunspot emitted an M-class solar flare — one-tenth the size of an X-class flare — leading to a coronal mass ejection aimed toward Earth that could cause auroras tonight as far south as Ohio and Indiana. If aimed toward Earth, the CME from these latest flares could lead to even more spectacular auroras, but could also damage satellites, communications and power systems. That cloud of charged plasma would arrive within 1 to 3 or 4 days, Steenburgh said, although CMEs triggered by energetic flares generally come quickly. The surge of activity might seem surprising, as the sun is approaching its solar minimum, with the lowest levels of activity in its 11-year cycle. "We are heading toward solar minimum, but the interesting thing about that is you can still have events, they're just not as frequent," Steenburgh said. "We're not having X-flares every day for a week, for instance — the activity is less frequent, but no less potentially strong." "These kind of events are just part of living with a star," Steenburgh added. This article was originally posted on Space.com at 10:55 a.m. EDT, on Wednesday.